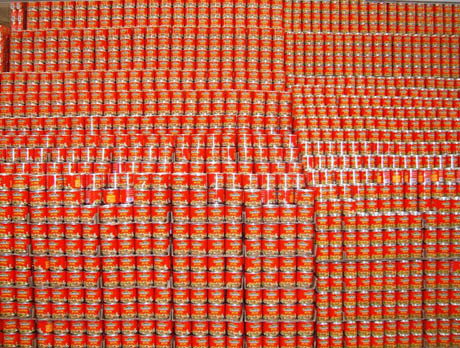 IMAGE: Canned chiles in a Mexico City supermarket by Flickr user hmerinomx. With less than a week to go, the schedule for Postopolis! DF has been announced, and it’s going to be an amazing week. I’m especially excited to introduce the speakers I invited, who (if I do say so myself) make an eclectic, prestigious, and extremely interesting group. On Wednesday, June 9, historian Rachel Laudan will kick things off at 4:00 pm. Her excellent blog, which has been a regular highlight in my RSS reader for some time now, often reads like a detective story: Laudan frequently begins with a witness statement (for example, Nobel prize-winning author Octavia Paz‘s observation that the curries of India reminded him of Mexican mole) and then puts together geographical, historical, and culinary clues to reach a Miss Marple-worthy elucidation. 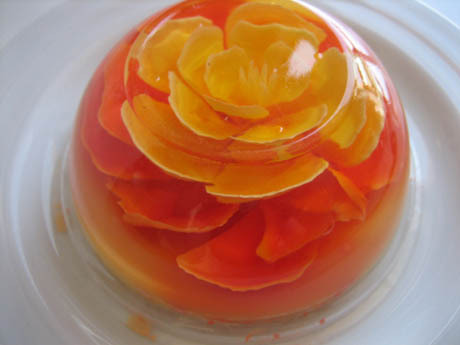 IMAGE: From a recent post by Rachel Laudan, “How to Make 3-D Gelatina,” a common Mexican treat with its roots in the eighteenth-century tradition of spectacular, sculptural desserts. Laudan will be bringing two or three such intriguing food mysteries to present at Postopolis! DF. Meanwhile, if there’s ever been anything that has puzzled or intrigued you about Mexican food, this will be a fantastic chance to ask the expert (in person, or leave a comment and I’ll make sure to pass it along). On Thursday, June 10, I’m looking forward to presenting the first Mexico City screening of artist Sissel Tolaas’ film, Talking Nose. She describes the work as “a project on smell as information — a system for communication and navigation,” and for the film, she “asked 2,000 people to please describe the smell of Mexico City in their own mother-tongue language.” From their narration, as well as on-the-ground smell capturing (“we went with black glasses and really forced our noses to do the job”), she created a olfactory map of the city that combines chemical analysis with linguistic descriptions. In addition to the film and soundtrack, there is a chance that Tolaas will be able to join us by video conference to discuss the project and answer any questions. 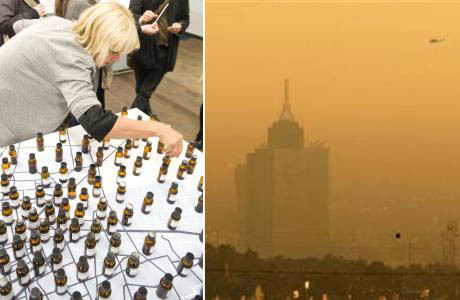 IMAGE: (left) Sissel Tolaas and the smells of Mexico City, via; (right) Mexico City smog “could be killing off residents’ sense of smell” according to scientists, photo by Daniel Aguilar for Reuters. Another of my guests will lead off the evening’s schedule on Friday, June 11, at 4:00 pm. Dr. Ravi Singh is “Chief Rust Buster” and distinguished research scientist at CIMMYT, the International Wheat and Maize Improvement Centre. He’s currently in St. Petersburg, presenting at a global conference to discuss how best to combat the threat that pandemic wheat rust poses to the world’s food supply. IMAGE: (left) Dr. Singh at Cornell University at the launch of the Durable Rust Resistance in Wheat project, via; (right) wheat breeders in protective clothing surveying “the first batch of mutant wheat and barley” in a rust-endemic hotspot in Kenya, photo by Prof. M.G. Kinyua, Moi University. Dr. Singh will not only discuss wheat breeding and the geographical implications of crop pandemics and prevention measures, but also give a short introduction to the fascinating history of CIMMYT and the Green Revolution, which began as a Rockefeller Foundation anti-hunger program after the Second World War, and fundamentally reshaped global land use, geopolitics, and the way the world is fed (Gary H. Toenniessen, director of agricultural programs for the Rockefeller Foundation, estimates that every day half the world’s population eats grain descended from one of the high yield Green Revolution varieties). Mexico City’s finest urban farmers, Sembradores Urbanos, will be my guests on Saturday, June 12, at 4:30 pm, discussing their work, which includes founding the Centro de Agricultura Urbana Romita — the first community space and demonstration plot dedicated to urban agriculture in Mexico — as well mapping community gardens, providing composting kits, and many other educational programs and activities. I’m looking forward to hearing their perspective on the particular challenges and opportunities Mexico City presents as a productive landscape. 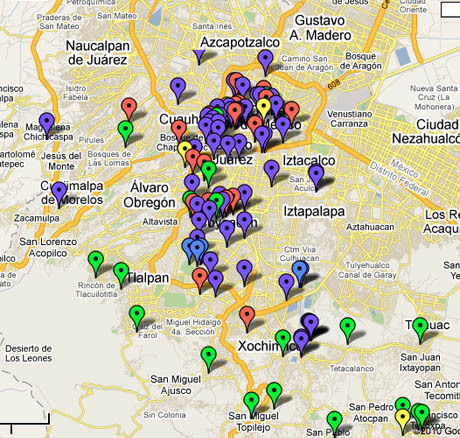 IMAGE: Map of the landscape of urban agriculture in Mexico City, by Sembradores Urbanos. My fifth speaker is a man of mystery, inspired by this post on Pruned. 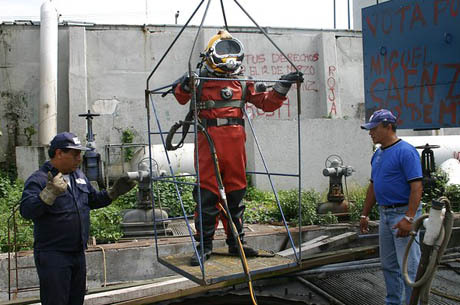 All things being equal, and pending written confirmation from the Sanitation Department, we will be joined on Saturday, June 10th, by an official Mexico City sewer diver. Back in 2004, Washington Post journalist Mary Jordan interviewed one of the team of four: Carlos Barrios Orta, a former accountant turned sewer driver whose job is to hand-clear obstructions, from plastic bottles to human bodies, from the 600 miles of wastewater pipes underneath Mexico City. Fingers crossed, this nameless diver will provide a unique insight into the infrastructural landscape of water and waste that lies beneath North America’s largest city. IMAGE: Carlos Barrios Orta being lowered into Mexico City’s sewers. Photo by Mary Jordan for The Washington Post. My co-curators and fellow bloggers have invited an equally diverse and inspiring selection of speakers (the full schedule is online here), there will be music and parties, and I have received some exciting suggestions for edible adventures in the city (thank you, commenters and emailers — please keep the ideas coming), so it should be a fantastic week! What a line-up!! Felicidades!! I look forward to reading more. And…. (drumroll) the miracle-working Daniela Hernandez has confirmed — Julio Cou Cámara, a sewer diver who has worked with the Sistema de Aguas for the past twenty-seven years, will be joining us at 1:30 pm on Saturday, June 12!